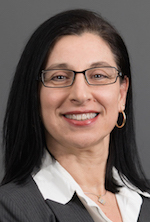 Andreana is Executive Vice President and Chief Financial Officer for Blue Cross Blue Cross Blue Shield of Massachusetts, the largest private health plan in Massachusetts and one of the largest independent, not-for-profit Blue Cross Blue Shield plans in the country. The company has more than $7 billion in revenue, serves nearly 3 million members, and is rated among the nation’s best health plans for overall member satisfaction and quality. Andreana is responsible for all financial, investment, real estate, actuarial, and underwriting activities related to the financial management of nearly $7 billion in annual revenues and more than $3 billion in assets. She formerly served as Chief Actuary for the company leading the Actuarial and Analytic Services department within the Finance division. In that capacity she was responsible for pricing, informatics, reserving, and financial forecasting for all of the company's product lines as well as developing the strategic and analytical input that is used to support our provider reimbursement plans and contract negotiations. Andreana also developed and led the analytical processes that are used to measure external regulatory and competitive influences on our business and product lines and the effectiveness of various provider and member programs that are designed to lower medical costs, specifically provider incentive programs, consumer choice products, and wellness and prevention benefits. Prior to joining Blue Cross in 2003, Andreana held a number of leadership roles at CIGNA Corporation. Her career has provided her with expertise in the areas of pricing and underwriting strategy, financial modeling and analysis, asset and liability modeling, investment management, medical economics and analysis, health plan operations, medical utilization and unit cost management, and budgeting and financial operations. Andreana is a Fellow of the Society of Actuaries and a member of the American Academy of Actuaries. She is also a member of the board of directors at Junior Achievement of Northern New England. She holds a B.S. in mathematics from the University of Massachusetts, Amherst.